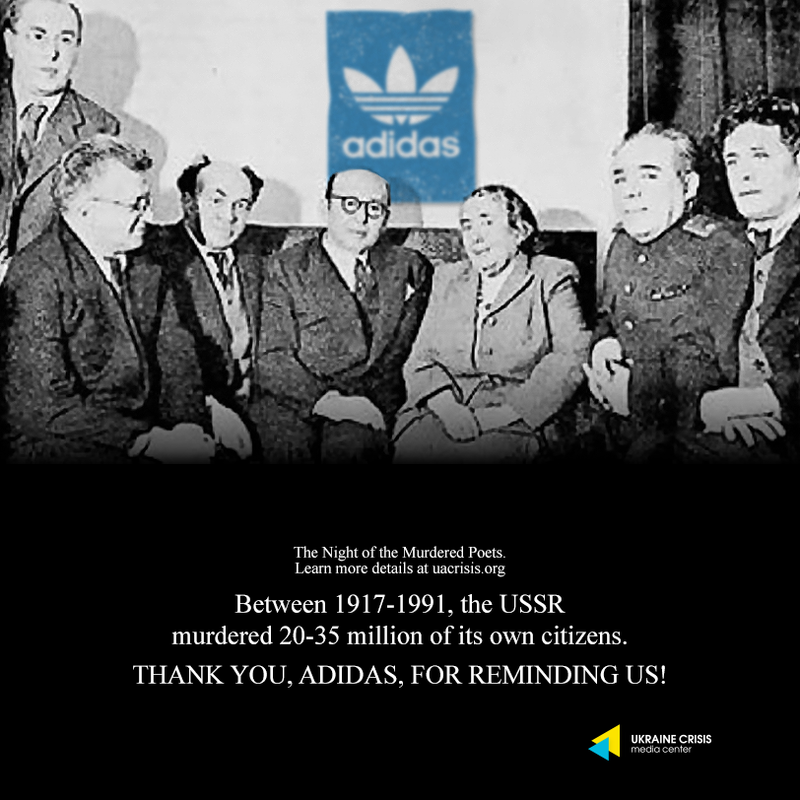 Adidas continues to align its marketing strategy with the Soviet legacy of persecution and totalitarianism, profiting from the sale of USSR-branded products. Since the company refuses to recall its ‘USSR’ product line and publicly apologize for launching it in the first place, UCMC publishes its eleventh protest visual. We encourage everyone to join this campaign and to use their network of contacts to deliver this message to the world. On August 12, 1952, after three years of isolation and torture, thirteen Soviet Jews were executed in Lubyanka Prison in Moscow on the charges of espionage and treason. Five of the executed Jews were Yiddish writers, all of whom were members of the Jewish Anti-Fascist Committee. The Committee was initially founded as the initiative of the NKVD to gain the support of the foreign Jews to help the Soviet Union win the war. However, after the World War II the Jewish Anti-Fascist Committee’s work on the documentation of the Holocaust contradicted the official Soviet policies related to it, thus the Committee was shut down based on the fabricated accusations. This is just one example of what the USSR really was. During 70 years of Soviet rule, the populations of many nations were decimated, displaced, killed by artificial famine, tortured, persecuted, their lives, cultures, and livelihoods destroyed. The victims of the Soviet communist regime are estimated at 20 to 35M – Ukrainians, Crimean Tatars, Lithuanians, Latvians, Estonians, Georgians, Armenians, Moldovans, Kazakhs, and many other nations suffered at the hands of the USSR. Profiting from the sale of Soviet symbols is also tantamount to politically supporting Russia’s attempt to resurrect the USSR through the illegal annexation of Crimea and occupation of eastern Ukraine, resulting in the deaths of over 10,000 people and the displacement of over 1,7M.